Acadia National Park is in the upper northeast corner of the United States in the state of Maine. It is truly a photographer’s paradise. I just returned from my first visit (October 2018) and I was lucky enough that the fall color was still showing. I spent 3 days in this park and barely scratched the surface. I also gathered up 5 tips for you on photographing Acadia National Park. Keep these tips in mind the next time you’re in Acadia - or any popular place with fall color. If you remember only one tip from this article, make it this one! Be sure to have a polarizer as part of your kit. I used my polarizer far more than any other filter in my bag during my 3 days in Acadia. The polarizer lets you maximize or minimize reflections in lakes, cut through shallow water in brooks and streams, and reduces glare from foliage for richer, more vibrant colors. Don’t forget to bring your polarizer! Broad sweeping landscapes and grand vistas are plentiful in Acadia. My kind of place! I love my wide angle lens. I had to remind myself to also photograph the details. For example, standing in a brook or stream I’d look for a few interesting stones and leaves and home in on those instead of the wider photo. 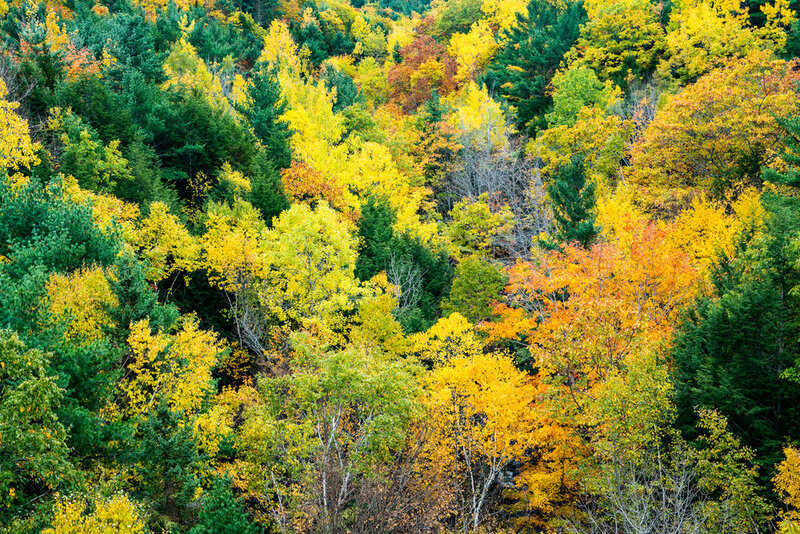 Also, break out the long lens and reach across a valley, filling the frame with colorful trees. Don’t get discouraged by a light or moderate rain. Protect your gear (and yourself) and hit the trails. Short of a full-on storm, the rain tends to come and go throughout the day. Rain plays to the photographer’s advantage in a few ways. Fresh water feeds the brooks and streams creating interesting surges in the water. Dust is washed away from the air, and when it breaks your photos are incredibly crisp and fresh. A moderate rain also reduces the number of people that venture out into the park. You might find you get that super-popular photo spot all to yourself! Acadia has miles and miles of trails and carriage roads to explore. Carve out some time and venture out on the carriage roads. One morning I spent about 3 hours exploring a loop of the carriage roads. I photographed great fall color, babbling brooks, and stone bridges and did not see another person the entire hike. I had this segment of the park to myself. If you’re skipping the carriage roads, you’re doing yourself a disservice. Also, take the time to head over to the Schoodic peninsula. It’s about an hour’s drive from Mount Desert Island, which is home to the bulk of Acadia’s natural treasures. Schoodic Point is a great place for a sunset shoot and the crowds are lighter. In some ways, Acadia is no different than other national parks. It is popular. There will be places where groups if not crowds of people are unavoidable. Cadillac Mountain at sunrise or sunset is one of these places. While I prefer to photograph my landscapes without people in them, there are times when that isn’t possible. Three days was certainly a whirlwind visit for Acadia National Park. There is so much more to see, do, and explore. I’m looking forward to my next visit. I know I’ll come back with more great photos - and maybe another 5 tips! 5 Reasons I'm Sticking With Lightroom. For Now.